Jakarta, December 6th, 2012 – Aston International and PT. 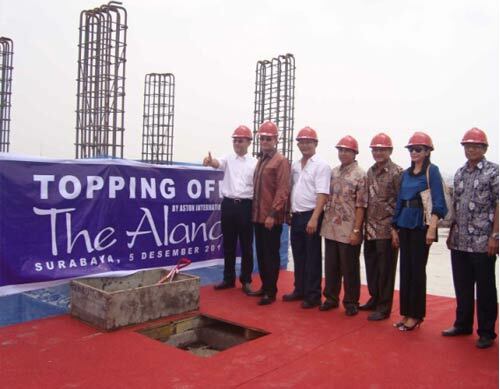 Saraswanti Graha Indah celebrated the topping off of Surabaya's first fashionable lifestyle Alana hotel development to date, The Alana Surabaya. The ceremony was attended by Mr. Norbert Vas – VP Sales & Marketing of Aston International, Mr. Ir. Y. N. Hari Hardono – CEO of PT. Saraswati Graha Indah, Mr. A. Adhi Harsanto, S.Pd. – President Director of PT. Saraswati Graha Indah and all the Boards of Director of PT. Saraswati Graha Indah. The Alana Surabaya will be a sophisticated yet welcoming 4 star hotel just of Jalan Achmad Yani nearby Surabaya's Juanda International Airport and the Rungkut Industrial district. The hotel will feature 162 airy guest rooms and suites and a wide range of facilities befitting an international business including several meeting rooms, coffee shop, lofty lobby lounge, Surabaya's only indoor hotel swimming pool, a full service day spa and a well equipped gym. Surabaya is Indonesia's second largest city and the capital of the province of East Java with a population of over 2.7 million and a greater metropolitan area of more than 6 million inhabitants. As the main seaport and commercial center for the eastern regions of Indonesia, Surabaya has become one of the liveliest and largest cities in Southeast Asia. Aston Internationals Vice President of Sales & Marketing, Mr. Norbert Vas, said: “The twenty first century consumer regards a four or five star hotel as a luxury commodity, an opportunity to buy into a lifestyle to which he or she aspires. It is by understanding the origins of this demand for quality and style – and even status – that the function, design and intent of this exciting new Alana Hotel can be properly put into context.”. Aston International also recently announced that the group is on track to open Indonesia's first Alana Hotel this coming February in Seminyak, Bali and that two more Alana Hotels are under development in the central Javanese cities of Yogyakarta and Solo. Seen in the image, speech by Mr. A. Adhi Harsanto, S.Pd - Presiden Director PT. Saraswanti Graha Indah. 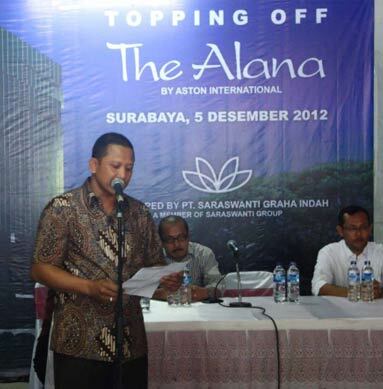 Seen in the image, Mr. Norbert Vas - Vice President of Sales Marketing Aston International (second from left) and Mr. Y. N. Hari Hardono - Owner of The Alana Surabaya also as a CEO of PT. Saraswanti Graha Indah (third from left) together with the management of PT. Saraswanti Graha Indah. Aston is Indonesia's leading hotel operator with over fifty (50) hotels and around 12.000 rooms and villas throughout the Indonesian archipelago and a growing presence in Malaysia and the Philippines. Aston's brands cover the entire spectrum of the accommodation market and range from ultra luxurious private pool villas to serviced apartments and select service economy class hotels, thus offering travelers Indonesia's vastest and most comprehensive hotel network.